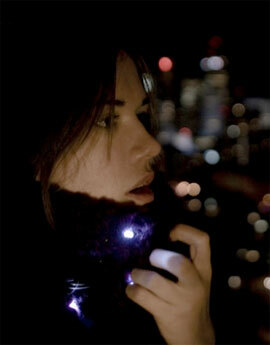 Hilary Hayes, industrial design student at the Ontario College of Art&Design (OCAD) in Toronto created a scarf which features dynamic light pattern depending on your breathing. She got the inspiration for this design from two areas, one being the fact that during winter time when the temperature reaches the freezing point we see our breath and that of others in form of water vapor clouds hanging in front of our faces. Her second inspirational area comes from the fact that people effected by asthma have to be more ware of their breathing pattern. Hilary took her breathing observations and beautified them by merging some eTextile magic with a clothing accessory like a scarf. A LilyPad temperature sensor, the LilyPad Arduino and power supply modules are integrated into the scarf. The temperature sensor near the mouth picks up the temperature variations which is translated via the LilyPad to points instead of degrees making this design concept independent of winter time only use. The LEDs in the scarf fade in and out in sync with the breathing, creating a subtile, dynamic light pattern on the scarf. A lovely style concept which could be transfered to a ‘hard wired’ eTextile chip to be used by fashion designers as an option to create more interactivity into future fashion.